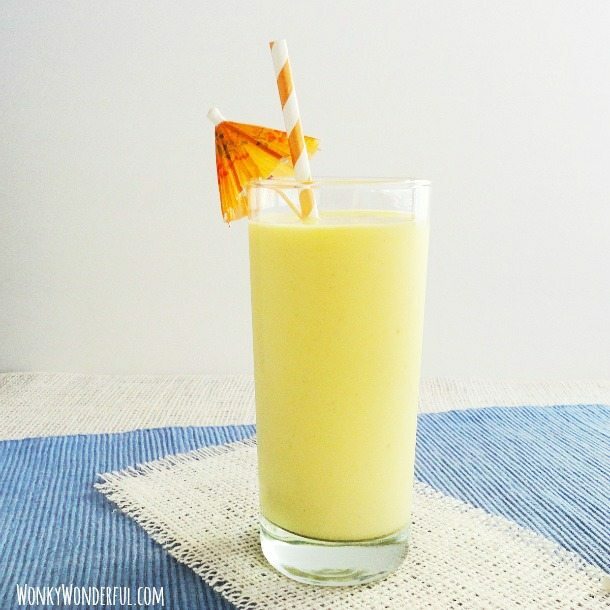 I am a HUGE fan of homemade smoothies and this Tropical Smoothie is my absolute favorite! Sipping one of these Tropical Smoothies takes me back to my more carefree days about ten years ago. I was in my mid twenties on vacation in the Caribbean and those ‘smoothies’ were more alcohol than fruit! Nowadays I make these healthy smoothies for my daughter and I to enjoy as a nutritious treat. These are definitely kid approved, she slurps an entire smoothie without stopping to take a breath! Several months ago the folks from Chobani sent me a box of their many wonderful Greek yogurt flavors. 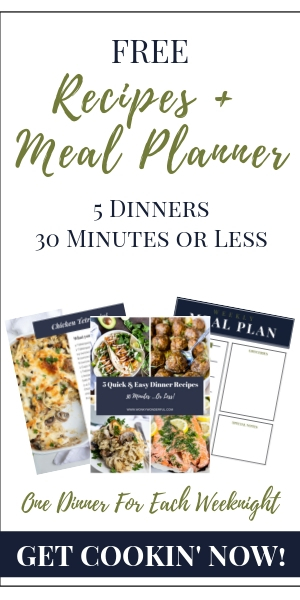 I was super excited to have such a variety to play around with in the kitchen, especially since I am such a fan of Chobani products. I first created a recipe for Bold Radish Ranch Dressing using the plain Chobani Greek yogurt. Next was this Tropical Smoothie that can be made with many different Greek yogurt flavors such as: Plain, Vanilla, Pineapple or Mango. And just to be clear I was not compensated for this post, I am just really fond of Chobani Greek yogurt! I hope you and your kiddos enjoy this simple and delicious smoothie as much as my daughter and I do! Place all ingredients into blender and blend until completely smooth. If using an immersion blender allow the frozen fruit to thaw slightly before blending. *I use Trader Joe's brand frozen pineapple and mango. 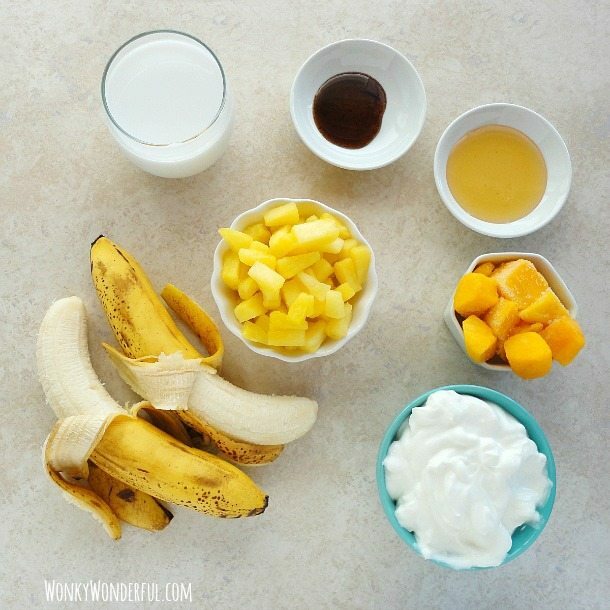 **Use plain, pineapple, vanilla or mango flavored Greek yogurt. This recipe yields approximately 4 servings. 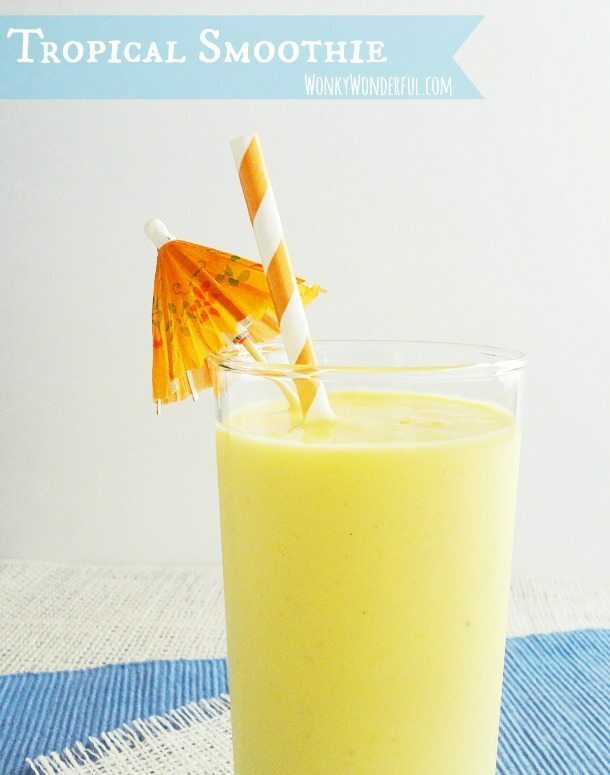 This looks like a perfect smoothie to enjoy on these super hot summer days! Most definitely, this smoothie will help you cool down! Have a fantastic week! Tropical smoothies are my favorite too! Yours looks so so delicious. Thanks Rachel! Have a wonderful week! Thanks Sofia, I hope you enjoy! I’m a huge fan of smoothies too! It’s a great & healthy treat to share with kids! I’m stopping by from Tatertots & Jello (#26 Easy & Flavorful Italian Chicken #37 Favorite Crock Pot Recipes) Have a great weekend! Hi Carrie, thanks for stopping by! I’m glad you like the tropical smoothie! This looks so good, Nicole! I too love Chobani yogurt and will be receiving a box from them soon. Since I am on a dairy free thing due to lactose intolerance, I will be taking a lactaid pill when I make my recipes! This looks so good. Pinning and sharing on social media! Hope you are having a good weekend! I seem to be ok with yogurt however, I haven’t eaten any dairy in the past week. I think about the time I receive the Chobani, I will start introducing a few things back into my diet to see if I can tolerate them and how much I can tolerate. Although, it has been kind of nice not eating any dairy. I have gotten a little creative with how I eat things now. And I have become somewhat of an avocado freak. I love avocados anyways but now I am putting them on sandwiches and on enchiladas all the time to use in place of cheese! This looks so yummy! I love fruity smoothies, and this one looks fabulous. Thanks for sharing the recipe! Thanks Kim! This is my favorite smoothie. Enjoy! This sounds so yummy! Must try this! So glad I saw this on Sunday Showcase. I love all the fruit you have in this! It is absolutely perfect for hot summer days! Chobani is my favorite yogurt too!!! Thanks Jocelyn! Gotta love all of those Chobani flavors. Have a wonderful weekend! These are perfect for these hot summer days. I’m craving it just looking at the picture. Thanks a lot for sharing! The yogurt adds a nice texture. I don’t normally use it but I’m definitely going to start now! Thanks Dave! I love Greek yogurt in my smoothies … Enjoy!